We are currently the largest luxury cruise company in Kington Langley and one of the largest in the world, we specialise in transocean voyages that take passengers to the most exotic of destinations around the world. The service and facilities offered on our fleet of ocean liners are world class and always improving. Please read the information below and fill out an application and help us increase our destinations that are currently offered to passengers. The company was created by an act of Parliament in the early months of 1867 to handle all important shipping lanes between Kington Langley and it's various colonies and dependencies and unified the various private trading companies that operated around the world under government contract. The company was known for much of it's early life as the 'Royal Kingtonian Steam Navigation Company' and was associated with the transporting of goods accross the vast oceans rather than a civilian cruise operator with it's early fleet encomapassing entirely of cargo steamships. It became the largest transport company in the empire with entire warehouses filled with packages and boxes labelled 'RKSNC' and the majority of suppliers in Great Langley used the company as their main cargo transporter. The company was so successful that it would often transport more mail and packages than the national postal company. At the start of mass emigration from the Kingtonian Empire to the colonies as the imperial monarchy became more oppressive, the company sought to make profit in transporting passengers. The company was privatised and renamed 'Grand Star Line' in 1903 as it handled a single shipping lane from Kington Langley to the mainland, it quickly became established as the largest passenger transport company in the country with over 70% of all immigrants travelling on Grand Star operated ships. While the company had several rivals that sought to acquire Grand Star, the company managed to maintain independence throughout the next century to become the one of the only domestically owned luxury ocean and cruise company in the country. After the fall in emigration figures immediately following the republican revolution, the company began to open more lines to other destinations by purchasing docks in international port cities around the world however it only recently changed it's name from Grand Star 'Line' to Grand Star 'Lines'. By the 50s, emigration had fully switched from sea to air transport and the company began to loose mass profits, in order to pay off debts many of the ships most loved and recognised ships were sold to other companies to be turned into museums, hotels etc. while the majority were simply scrapped. 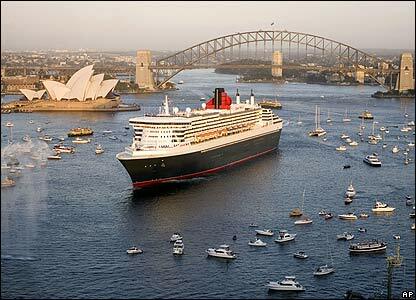 Cruise holidays began to become popular once more during the early 80s, by 2005 it owned a number of ports and shipyards around the country that often saw as many as 4 ships a year being ordered and placed under construction. The company also continued to expand internationally with it's portfolio growing every year, it also discussed the possibility of entering other industries however this idea was dropped in order to focus on maintaining their prestigious position in the shipping industry. Since the re-installment of the monarchy, the company has recieved royal endorsement and one of the few companies from the republican era to retain their place on the 'protected entity' list by the government. The headquarters are located in the 'Grand Star Building' in Kingsmouth, it currently has the largest headquarters of any cruise company in Kington Langley. All our vessals are carefully constructed and planned so that even the cheapest of our cabins are of the best quality in the world. (All pictures used below are from the RMS Grand Duke) Below is the list of our current classes and the main amenities and perks they offer to customers. The Monarch suite is the best a modern ocean liner can offer in terms of luxury at sea, it is a 2 floor cabin with living and relaxation areas on the lower floor and sleeping and fitness areas upstairs. We pride ourselves in offering to our customers a luxury sea-going apartment with personal staff members catering to their every need. Customers will never be neglected in a Monarch suite. The Duchess suite offers luxury accomadation with personal service. This single-storey stateroom makes room for living and sleeping areas with plenty of space left over for a small kitchen and dining area including a private balcony. The Grand Suite aims to go beyond the basic necessities of a cross-ocean cabin. A small private balcony accompanied by a soft bed and flat screen TV with multiple channels. The Cruise suite is the most basic cabin offered by Grand Star. They offer the basic needs for most passengers who travel with us, they are also the most abundant and therefore there may be slight deferences depending on the room. Cruise suite passengers do not get a private balcony but can enjoy refreshing walks around the many boat decks on our liners, passengers may not get the size of a Monarch suite but they get the luxury. Here at Grand Star we try to make our services as international as possible, below are all our current international suppliers and the product they supply to us. PENDING = Negotiation phase, company is not yet an official supplier. Below is the application that will establish a Grand Star Lines route to your designated port. If you wish to register more than one ship to one port or one or more ships to multiple docks, you do not need to fill out another application. You will have to however if you wish to register one or more ships to multiple ports. We are always looking for companies willing to supply us. If you wish to supply our company with your product (catering, fuel etc.) then fill in the application below. Last edited by Kington Langley on Wed Feb 05, 2014 8:16 pm, edited 87 times in total. Ohsung Petroleum has noted Grand Star Line's recent entry into the International Community and we would like to be the first to congratulate your company on such a noble venture. Ohsung Petroleum is Sensal's largest oil company and we have a long history of providing Sensal with oil for the past fifty-two years. In this time, Ohsung Petroleum has become a major producer in oil with two foreign oilfields each numbering over 100 billion barrels of oil. This recent massive influx of oil has caused the board to venture out to foreign nations and company's in need of such resources to both relieve ourselves as well as provide such an invaluable service. Please visit our storefront at www.ohsungpetrol.com, where the entirety of our services may be seen. Thank you for your time and please consider this deal with us. Enclosed is an application and we hope we may see eachother again as our oil flows in your ships. Product description: All of our diesel is of ultra-low-sulfur type and this petroleum derivative is something that is oh higher quality then gasoline, but not as high as kerosene. Used mainly by large trucks or high-performance cars requiring such fuels, diesel is not used by the common driver in many areas and is thus not used nearly as much as gasoline. At a higher octane level then regular gasoline though, diesel is priced higher then regular gasoline due to higher costs in refining crude oil to diesel. Thankyou for welcoming our company into the international market, we felt it was the right time to begin expanding internationally. We are also grateful for your offer to supply our ships with your petroleum, we have reviewed your offer and took the liberty of visiting your storefront. We are more than happy to accept your application and hope that you can begin supplying us as soon as possible. Thankyou for your application, it has been reviewed and accepted, we shall add your port and designated docks to our list of international round-the-world cruise destinations. Hello! We would like to make an application. We are a large, free, powerful and beautiful country with a very long history that stretches back thousands upon thousands of years. We are a union of many nations and cultures. The most dominant and shared by almost everyone is that of the Hevoran (Savedlish) People. It has its roots lying in an ancient creole culture that emerged from extensive contact between a bronze age hellenic and norse civilization which evolved convergeantly on an fictional, alternate universe Earth. Your application has been accepted, your ports and docks have been added to our list of international round-the-world cruise destinations. Thankyou for choosing Grand Star! Last edited by Kington Langley on Thu Mar 10, 2011 8:59 am, edited 1 time in total. Designated dock(s): 5 and 9. Hippostania wrote: Wealth means that you are successful. We happily accept your application. Your port and docks have been added to our list of international round-the-world cruise destinations. Thankyou for choosing Grand Star. Last edited by Zhenghou on Thu Mar 10, 2011 11:08 am, edited 1 time in total. Thankyou for your application, it has been accepted. Your ports and docks have been added to our list of international round-the-world cruise destinations. We have reviewed your proposal and visited your storefront, we would like you to supply us with your finest oriental style furniture that would go in select Monarch and Duchess suite staterooms. We hope that you accept, we are looking forward to your response. Last edited by Kington Langley on Thu Mar 10, 2011 1:37 pm, edited 1 time in total. We would just like to let you know that we are still awaiting confirmation for our booking. Designated dock(s): There is no dock number, since it is a small inlet. Last edited by Astholm on Thu Mar 10, 2011 3:25 pm, edited 1 time in total. [spoiler=About Me]Based on the United Kingdom, but enlarged version with alternate history. I have multiple puppets here; only a select few are used to represent the continent of Astholm; others used represent Westholme, and do not artificially boost my nation's statistics.Previously i used puppets with nation names that did not identify as Astholm (e.g. Australis Australia; now all new puppets use ASTHLM, NORTHLM, SOUTHLM, WESTHLM (HLM denoting The Holmes. Darrenovia wrote: We would just like to let you know that we are still awaiting confirmation for our booking. We have reviewed your application and it has been accepted, please accept our deepest apologies. Your port and dock has been added to our list of international round-the-would cruise destinations. Could you please state the dock number that Grand Star ships will use to dock at. Thankyou for updating your application, it has been reviewed and accepted, your port is now on our list of international round-the-world cruise destinations. Thanyou for choosing Grand Star. To: The Grand Star Line Company. From: The Globexian Resources Store Department. Local Time & Date: 4:30 P.M., 11th of March 2011. It is in Globexian Resources main views to supply quality minerals, gems and jewelry to companies and people all over the world. That is why we wish to request a possibility to sell Minerals/Gems/Jewelry on-board your boats and any other areas you may wish if you accept our offer. We hope to hear from you as soon as possible. Last edited by Globexanter on Fri Mar 11, 2011 8:34 am, edited 2 times in total. We have reviewed your offer and visited your storefront and where shocked by the number of jems, minerals and jewels you offer. After discussions with the board we have all agreed that these products would go down extremely well with customers and therefore would be honoured if you would submit an application, by doing so you would become our official supplier of fine jewellery. We thank you for accepting our offer. We have therefore sent the application, if accepted, we expect to be quickly able to start creating, setting up and delivering minerals to the areas of need. Full name of company: Globexian Resources. Name of the country the company is officially registered in: The United Kingdom of Globexanter. Name of product: Gems, Jewelry, Minerals (Valuables). Product description: Various (due to number). Price: Various (due to number). We would wish to inquire if this will cost any payment, if you wish a certain percentage of the revenues on each ship. We also wish to inquire on the security in the areas where the products shall be sold.